Sharon Smith gets in training for the Virgin Money London Marathon. A charity shop manager from the north is taking on one of the UK’s biggest sporting challenges in memory of her cousin. 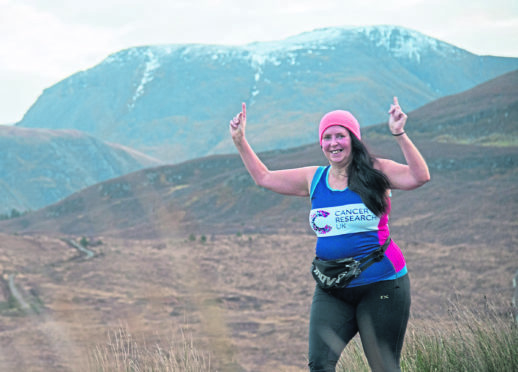 Sharon Smith who runs the Cancer Research shop in Fort William, was heartbroken when her cousin Laura Barr died at the age of 51 after a four year battle with a brain tumour. She has vowed to tackle the Virgin Money London Marathon by completing 26.2 miles to cross the finish line at the event on April 28 next year. And she hopes to raise vital funds for research in to the prevention and treatment of cancer. Her cousin who died on March 14 this year will be on the runner’s mind every step of the way. Ms Smith, 51, said: “Laura was so special. “We were very close in age and even looked similar as we were growing up. There was a lot of laughter when we were together. “I miss Laura’s laughter, her smile and that sparkle which was always in her eyes. I was so proud of Laura and proud that through her job as a nurse she helped many people. “The whole family were shocked when we heard she had cancer but she remained upbeat and determined to make the most of every single second. “Running 26 miles will be tough but that’s nothing compared to the challenges Laura met and tackled head on in the last few years of her life. It will be Ms Smith’s fourth marathon as she has already completed the Fort William marathon twice and a marathon which was held in Glasgow to mark the Millennium. She said: “Laura will be on my mind every step of the 26 miles.